Thank you for allowing us to continue our strong tradition of quality, faith-based education. It is our mission to prepare our students to be well-rounded and successful for a world so in need of strong, ethical leaders. 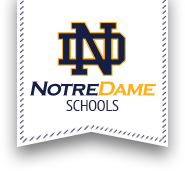 The World Ready Campaign will allow Notre Dame to remain at the forefront as a modern educator with its rich array of classes and opportunities, and our proposed first-class multipurpose center. Your gift makes a difference, and will help make tomorrow’s leaders great. Parents entrust us with their most prized possessions – their children. And we take that responsibility seriously. We challenge our youth with curriculum that makes them think, and engage them in thoughtful and deep discussions, equipping them to thrive in a more complex, global world. Special emphasis is placed on the teaching of moral values, effective oral and written communication skills, critical thinking, and creative problem solving — the tools needed for the jobs of the future. No matter where in the world they land, or what field of study they choose to pursue, with a Notre Dame education, they will be ready! At Notre Dame, education rests on the pillars of morals and faith. As a family man, an attorney and an alumnus who believes in my community, I am confident in Notre Dame’s ability to prepare young people for the world. Because of its rich, hallowed history, I am honored to serve as chairman for this campaign. We all want the same thing for our kids: the chance to thrive and succeed. Notre Dame stands at the precipice of change. Tremendous growth in enrollment and programs recently necessitate that we take hold of this opportunity to strengthen and build Catholic education for generations to come. With the help and hard work of dedicated supporters, the campaign has gained great momentum over the past year. Our vision is now within our reach. The construction of a new multipurpose space to bolster athletics, music, arts and other enriching experiences that are being cut from public school budgets will benefit our entire community. Perhaps even more vital, is the endowed scholarship fund. This will provide tuition assistance so that more families can have a viable educational option rooted in Catholic values. Now is the time to come together to support faith-based, college-preparatory education in the Utica area. Please consider helping us make our kids world ready by making a gift to this campaign today.